How to Clean Cat Urine from Hardwood Floors | Why Do Cats Spray? Being a cat owner is a package deal. When you sign up for it, you’re agreeing to deal with every aspect of the pet parent life, from playing with your kitty, to snuggling with her, and to cleaning up her messes. Unfortunately, cleaning up her accidents can be a frequent duty, and it’s even worse when it seems like there are still traces of urine smell in different parts of the house. Yeah—not so enjoyable. We understand the struggle, so we’ve put together a comprehensive guide on how to clean cat urine from various surfaces. 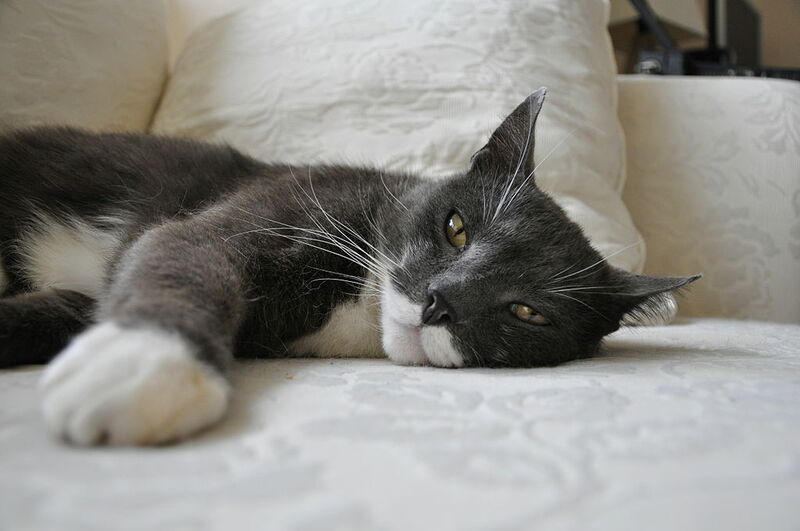 Cleaning up cat urine on any piece of furniture before it dries is especially crucial, because it can soak deep down in there, even as far as the frame. Use some paper towels to soak up as much pee as possible, and then soak it with enzymatic cleaner. Cover it loosely with something like aluminum foil that will protect it from your cat’s meddling and let others know not to sit on it, and let it be for 10 to 15 minutes. If the smell isn’t gone by the next day, repeating this process is a great idea! You can also try using the homemade solutions that you use when cleaning the carpet, and see if that helps with the odor. Follow the same steps as you do when cleaning the carpet, except for the wet vac step. Let is sit and dry with a fan directly hitting it and the windows open. Shut the door so that your cat can’t return to the spot! You’ll first need some paper towels or a rag you’re not attached to. Press down on the soiled area, soaking up as much urine as you can. Then, get your handy-dandy enzymatic cleaner and follow the instructions on the bottle closely. Create a solution composed of equal parts vinegar and water, and pour it over the area. Grab your box of baking soda and sprinkle it generously over the spot. Now, make another solution that’s made up of a ½ a cup of hydrogen peroxide and 1 teaspoon of dish detergent. Drench the soiled area with this solution and give it a good scrub! Last, you’ll need a wet vac to remove all the chemicals and urine particles, and voilà! Success! This process is a little more complex because hardwood floors can be ruined if you’re not careful. First, wipe the puddle with an old rag, and use multiple if necessary. Before using any old cleaning solution that you have, do a little research to see what chemicals are safe for the type of wood your floor is, and make sure that the cleaner is specifically for cleaning up pet urine. Test is on a small, unnoticeable area of your floor before using it to clean the spot so you can ensure that it won’t do any damage. After finding and using the cleaner, damp another old rag with that trusty hydrogen peroxide and water concoction, and cover the spot with it. Let it sit for couple hours (or if necessary, overnight), and then remove any liquid that’s left over. Lastly, cover it with baking soda to finish soaking up any remaining dampness, and then clean it up and let the spot dry some more. The first step in this case is to soak your clothes with cold water in a bucket. Pour in 2 to 3 cups of white vinegar, and let it be for at least two hours. Dump the water outside or in the toilet, ring the clothes free of liquid (with gloves, of course), and throw them into the washer with a load of detergent. Take them out and give them a good sniff to see if the cat pee smell is gone. If so, let them air dry. If not, put them in the washer again, but with detergent and enzymatic cleaner. That should do the trick! 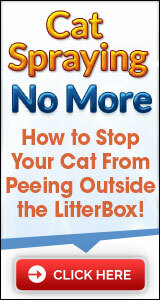 The better you know how to clean cat urine, the less likely she is to return and repeat the process. Now that you know how to clean cat urine from multiple surfaces, we hope you can get back to the more pleasant aspects of caring for your furry little friend!